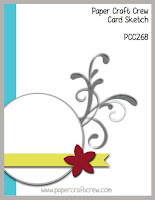 Tina's Crop Shop: PCC268 Sketch Challenge with Gina K Designs Festive Foliag! PCC268 Sketch Challenge with Gina K Designs Festive Foliag! Hello and Happy Hump Day! I'm super excited to be back at Paper Craft Crew this week with my take on a super fun sketch! There are soooo many possibilities with this one.. take a look! How fun is that??!! I decided since I did the spotlighting technique on mine and had stamped pine branches and cones that mine didn't really need the banner. The stamp set I used was one I bought last year from Gina K Designs.. it's called Festive Foliage by Claire Brennan! I used it for so many of my cards last year and I do believe it will be used for quite a few this year as well! It has some awesome Christmas foliage images as well as sentiments! I used my Misti to stamp the images with SU Sahara Sand Ink onto Neenah 110# Classic Crest Solar White Card Base. Once I had it stamped on the card base, I stamped it on a piece of Whisper White Cardstock again in Sahara Sand. I then used a sponge dauber to add SU Chocolate Chip, Early Espresso, Old Olive, and Mossy Meadow (retired) inks to the stamp as well. I used the SU Layering Circle Framelits to the section that I wanted to spotlight and added an Old Olive small scallop border (also from the same die set). The sentiment was added at the top on the right in Old Olive Ink and then Versamark and clear embossed. 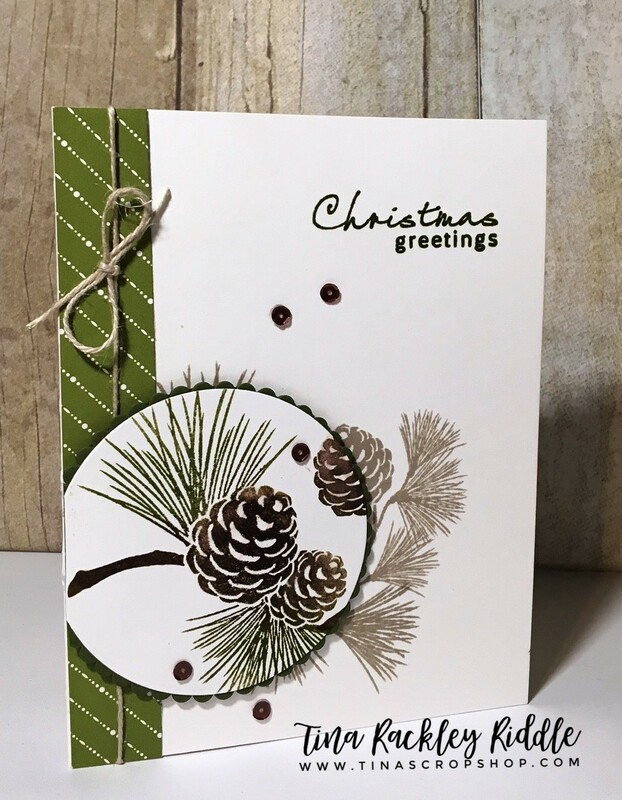 I used a 3/4" x 5 1/2" piece of Merry Little Christmas DSP in an Old Olive pattern. I ran some Natural Thread around the strip of DSP and tied it in a small bow and then added the circle layer with the spotlighted design over it. I used my scissors to snip the overhanged portion off from the back of the card. Lastly.. as usual, I added a few Pretty Pink Posh 4mm sequins in Espresso with Multi Medium Matt adhesive.